Did you know you can encourage select mast trees to produce bumper acorn crops year after year? Here’s how. Research by foresters has proved that carefully selected oak and other mast-producing trees can be helped nutritionally by following a fertilization program. After a period of time, if other conditions are favorable, the tree will produce a high yield of mast. Following are the steps to having your own secret "feast trees." Since there are about 80 different species of oaks in this country, I am going to use the white oak as an example here. The white oak is my favorite oak to fertilize because it is found throughout much of eastern United States and its acorn is a favorite food of deer. White oak acorns have less tannin than those produced by the various red oaks, making them especially attractive to deer. Tannin causes acorns to taste bitter. Native Americans and early explorers and settlers made white oak acorns palatable by boiling the meat of the acorn — I have eaten acorns prepared that way, and they’re not bad. The meat is even sweeter to the taste when the acorns are from an oak tree that has been fertilized for a few years. Some hunters are surprised to learn that many white oaks, as well as other oaks, do not produce mast every year. In fact, some oaks do not have a record of ever producing acorns. Individual white oak trees tend to have either a very good or a very poor seed crop and are consistent in seed production from year to year, be it good or bad. When growing free of competition, with ample sunlight and fertile soils, some trees have been known to produce acorns starting as early as 25 years of age. Other trees growing in thick forest conditions with lots of competition, poor sunlight and poor soils might not produce acorns until they are well over 50 years of age or older. Some trees never produce acorns. You must spend the time to select white oak trees that you know produce acorns, and then go to work to make them even more productive. Sometimes this takes a couple of years or more. Once you find a good seed-producer, mark the tree so you can find it again. It's a good idea to mark its location on your topo map and to store its location in a GPS. I like scouting for good seed-producing trees in the early fall when squirrels are feeding in white oaks. Find a white oak full of feeding squirrels and you have probably found a good "feast tree." Also, you will have the makings of a squirrel stew. Keep in mind that even the best acorn-producing white oaks can have a bad year. White oaks, and many other oaks, flower when the leaves begin to emerge at the first of spring. Dry winds or freezing temperatures can be detrimental to flower development, and that year's acorn crop can be lost. 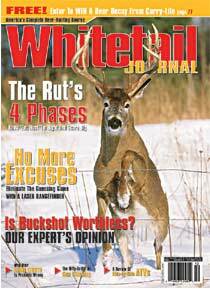 For this reason, and the fact that you don't want to hunt too frequently around just one tree and cause the deer feeding there to become nocturnal, it's a good idea to have several trees in a variety of settings to fertilize. At present I am working with six trees — three are in a bottomland setting and three are on a mountaintop setting. If a late frost gets some of them, there's a chance that the others won't be damaged. 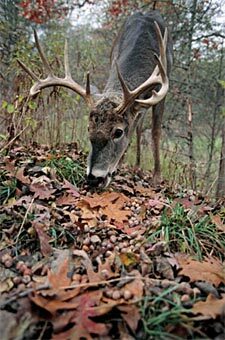 In good seed-producing years I have six good places to hunt without putting too much pressure on any one location. To be good seed producers, oaks must be as free of competition as possible. If the oak tree you’ve selected to fertilize has other trees crowding it, you need to eliminate as many as practical, especially those which touch the crown (top of the tree). Studies have shown that acorn-producing white oaks growing in thick woods might produce 10,000 acorns in a good year. A tree in a more open environment might produce 20,000 or more. The first involves the use of 13-13-13 granular fertilizer. This should be applied in early spring at a rate of two pounds per 1,000 square feet of crown. A mature white oak with a crown measuring 80x80 feet, or 6,400 square feet, requires about 13 pounds of fertilizer, for example. Apply the fertilizer from the edge of the drip line; that is, the outer edge of the furthermost tips of branches, to within three feet of the trunk of the tree. If there are a lot of leaves and limbs on the ground in the fertilized area, rake them away so that the fertilizer comes in contact with the soil quickly. I like to disc up the soil lightly where I’m going to fertilize under an oak with an ATV-pulled disc. Use a Cyclone-type hand seeder/fertilizer spreader to distribute the granular fertilizer uniformly. A second method is to purchase a box of fruit or shade-tree fertilizer spikes at a nursery or garden-supply store and follow the instructions on the box. Spikes are more expensive than granular fertilizer but easy to carry into the woods for use. While the preceding is a good way to increase the acorn production of a selected oak, don’t expect to see bushels of acorns appear on the tree the next fall. Based on my experience, it’s usually the third year (with all other things going right, such as no late spring frost) that you can see a significant increase in the acorn crop.